Showering each employee with carefully planned streams of air prevents human-borne contaminants from entering your plant. Air is sucked through the floor grate. It's light, strong, removable and the rough texture scrapes debris from the soles of workers’ shoes. We can re-design your plant entrance to accommodate the air shower (and complete gowning rooms). In over 50 installations throughout North America, the Lasco Air Shower PE has proven to reduce hair and other contamination complaints. Lasco Services designed and tested the Lasco Airshower PE to remove human-borne contaminants such as large particles, hair and lint from anyone passing through its twelve foot tunnel. Unlike other debris removal devices, such as hair and lint rollers, our airshower requires no action from plant personnel other than entering and exiting the air shower. Plus, the air shower's 40,000 cfm shears across every inch of the body's surface (from calves up) in the average 4 seconds it takes a plant worker to pass through it. The standard Lasco Airshower measures 12' long by 6' wide and 9' tall, and it can be customized to fit available space. 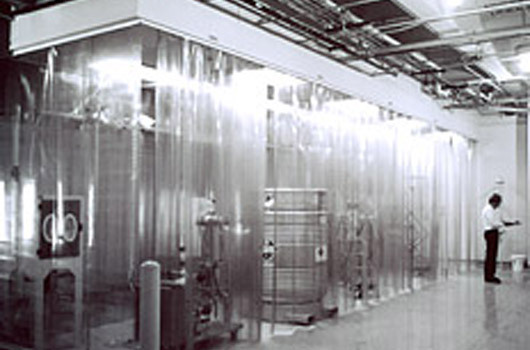 Each air shower is pre-fabricated, assembled, and tested prior to shipment. The air shower comes in pre-fabricated modules for quick installation and little plant down time. And front-accessible filter drawers and fans will make your maintenance crew happy. We can help you re-design your plant entrance to accommodate the air shower (and complete gowning rooms). We also provide turnkey installations. Call us at 1-800-81-LASCO for a free consultation. 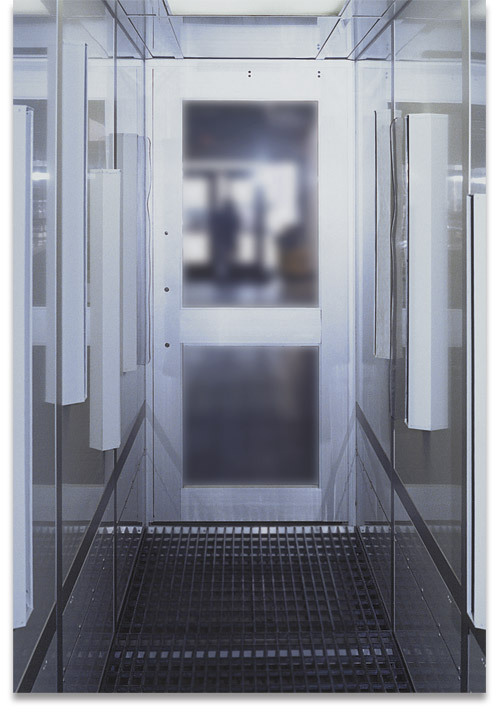 The external presence sensor/time delay allows high velocity fans to reach maximum speed before workers enter air shower for maximum efficiency. The fans automatically shut off after four seconds (shut off time adjustable). The ceiling system uses common, inexpensive lighting. 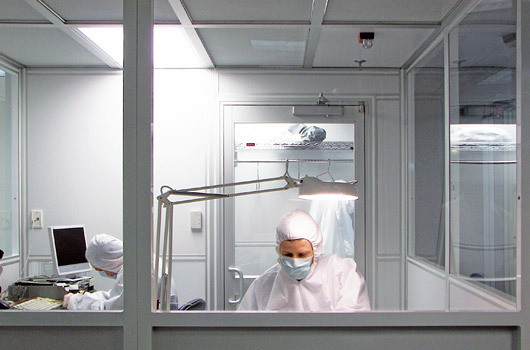 Lasco's own specially coated, antistatic walls resist particle adherence. Vertical air nozzles are part of the wall, not added on. Eight vertical blower nozzles direct over 40,000 cubic feet of air per minute, shearing loose hair and debris from workers' clothing. 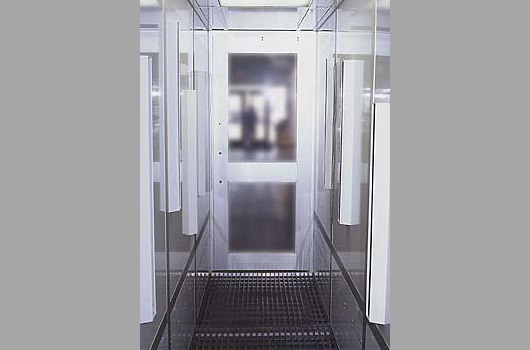 Optional (but highly recommended) door forms seal between air shower and outside environment. Studies show that a door slows down an employee's pace resulting in greater hair and loose particle removal. From the floor, air passes through filters, ensuring that only clean air is blowing on personnel. The filters are accessible in a pull-out drawer from inside the air shower for quick maintenance. 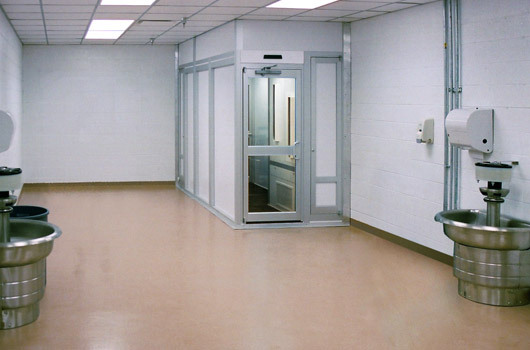 Filter access doors – standard 1 inch pleated filters trap hair and other debris. Because Lasco has integrated flip-up access panels in shower walls, all of the filters can be changed in less than 5 minutes. 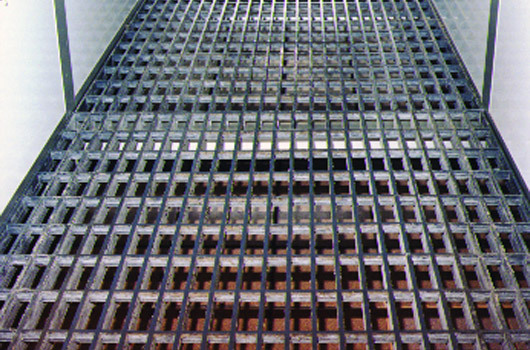 Light, strong, and removable, the floor grate allows air to recirculate. It's rough texture scrapes debris from the soles of worker's shoes.